Editor’s note: On March 1, Joshua Gotbaum testified before the Senate Committee on Finance on what congress can do to help people in multiemployer pension programs. Mr. Chairman, Senator Wyden, and members of the Committee, I am honored and grateful for the opportunity to speak about the sad choices facing some distressed multiemployer pension plans, and about the steps that Congress might take in response, some of which could make life better for the 1,000,000+ people in those plans, and some of which could make it worse. MPRA is – and should be – controversial. There is no question that the Multiemployer Pension Reform Act of 2014 was and remains controversial: it amended the Employee Retirement Income Security Act (ERISA), whose purpose is to protect retiree benefits, and allows some distressed pension plans to cut retirees’ benefits – but only if doing so would save the plan and preserve benefits by preventing even greater cuts in the future. Many pension advocates were, and remain, outraged both at the substance of the bill and the means of its enactment.1 AARP, one of the best-organized advocates for seniors, organized a nationwide campaign in opposition. They were joined by the Teamsters union, the Machinists union and other advocacy groups. Opponents reminded Congress of ERISA’s purpose2, that pensions are a commitment for which people work decades, that many retirees can’t afford significant cuts, and that for many the option of going back to work or living on their investments is unrealistic. Nonetheless, Chairman Kline and Ranking Democrat George Miller – public servants with very different political orientations – decided legislation was necessary and negotiated its terms. The Service Employees International Union (SEIU), the United Food & Commercial Workers Union (UFCW) and many other unions either actively supported the compromise bill or chose not to oppose it. I believe they did so, not to undermine theses pensions — which continue to provide lifetime retirement benefits while other retirement forms increasingly do not – but to preserve them. They also did so to avoid having healthy multiemployer plans be “tainted”, lest employers in healthy plans decide to withdraw and let the entire system collapse. Did distressed multiemployer plans cause their own distress? No. Multiemployer plans are negotiated between a union and an employer association, largely in industries like construction or trucking or food stores where there are many small business employers who cannot take on the responsibility of running a pension. The plans themselves are run professionally and businesses and unions are equally represented as trustees. Throughout the 1990’s multiemployer plans, like virtually all pension plans, were under conventional measures fully funded or overfunded. However, since 2001, multiemployer plans were hit by a double whammy: Like virtually all pensions, the stock market crashes of 2001 and 2008/9 left them seriously underfunded (and, like other pension funds, the underfunding is generally not due to bad investment choices, but to broad market movements). Unlike other pensions, however, many of the retirees in these plans are “orphans” who worked for companies that are no longer in the plan. The diversified employer base historically has protected multiemployer plans: if one employer went out of business, there were been plenty of others to cover any shortfall. However, some multiemployer plans have experienced widespread losses of employers due to major industry changes such as trucking deregulation or consolidation, so the remaining employer base was now much less diversified. As a result, the companies and workers still active in the plan are now left holding the (empty) bag. They are being asked to pay not only their own costs but also for the funding shortfalls of benefits to others. To their credit, both employers and employees in most distressed plans have increased their contributions, sometimes very substantially. However, when there are more “orphans” than active participants, at some point the burden becomes too great: employers negotiate to leave the plan and unions, ultimately, accept. The result is a “death spiral” under which employers that can withdraw do so and the burden on the remaining employers becomes intolerable, leading to mass withdrawal, many bankruptcies, and eventually, plan insolvency. Before MPRA, most plans had no choice but to accept that terrible result. Once they run out of money, all retirees’ benefits are cut to PBGC guarantee levels – which, under ERISA, usually results in cuts from promised benefit levels, sometimes very large cuts. Is the right response for Congress to repeal MPRA — or instead to find additional ways to preserve plans? It is not surprising that these controversies continue as plans begin to consider and apply for the painful choices that MPRA offers. Several bills have been introduced either to repeal MPRA’s benefit suspension provisions outright3, or to add additional procedural requirements4. These proposals, while motivated by the best of intentions, would likely result in greater benefit cuts and greater suffering. In order to see why these efforts to help the participants in distressed plans will end up hurting them, it’s important to remember that the alternative to a planned benefit reduction under MPRA is an even worse result. What MPRA did was to allow plans that otherwise would fail entirely to preserve benefits and keep them from falling all the way to PBGC levels. 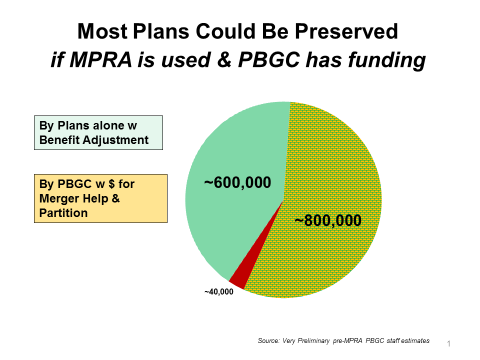 Under MPRA, severely distressed plans can propose a plan to cut benefits, but in every case a participant gets at least 10% more than PBGC would provide. In many cases, vulnerable participants suffer no cuts. For example, in the Central States proposal currently being reviewed, about a third of participants would suffer no cuts at all5. Without MPRA, Central States and other distressed plans will become insolvent – and most participants’ pensions will be cut far more. Even worse, the insolvency of Central States would completely drain PBGC’s multiemployer reserves, so participants would end up being cut far below PBGC guarantee levels. One analyst estimated that, if PBGC becomes insolvent, ongoing premiums would only cover about 10% of Central States pension benefits – that would mean a 90% cut. No one wants to see pension benefits cut – but the alternative to the MPRA process is much greater pension cuts, and for many perhaps no pensions at all. PBGC can preserve plans by financial assistance for mergers and “partitioning”. In MPRA, Congress recognized that PBGC can play an essential role in preserving distressed plans by providing financial assistance to facilitate plan mergers, and by “partition”: assuming responsibility for some of a plan’s obligations. Historically, these have been obligations for “orphans”, retirees of companies that no longer contribute to the plan; under partition, PBGC assumes responsibility for some obligations, but pays those obligations at PBGC benefit levels rather than at a plan’s promised levels. MPRA gave PBGC flexibility in both merger assistance and in the design of partitions to minimize the loss that comes from receiving only PBGC benefits. With PBGC financial assistance, either merger assistance or partition, many plans will be able to recover using contributions from the remaining active employers and employees. According to some early analysis, PBGC partitioning &/or merger assistance might help preserve plans covering some 800,000 people. But PBGC can’t do so if it is underfunded. However, MPRA limited PBGC’s ability to partition if PBGC is itself at risk of insolvency within 10 years and if doing so makes that insolvency more likely. 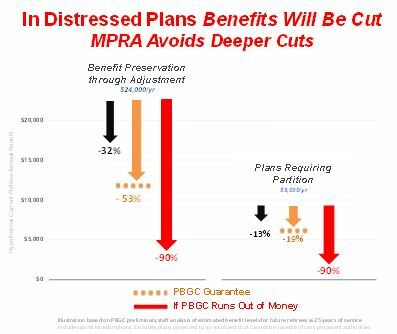 Although MPRA increased PBGC premiums to some extent and, by permitting plans to avoid insolvency via benefit reductions, reduced and deferred the likelihood of some plan failures, both PBGC and CBO project that PBGC’s multiemployer program will be insolvent in just 8 years. Unless Congress is willing to eliminate this requirement – or to allow significantly increased multiemployer premiums – PBGC’s use of financial assistance for mergers and of partition to preserve most distressed plans cannot be realized. To preserve the multiemployer system, PBGC must be adequately funded. MPRA increased multiemployer premiums from $12 per person per year to the current $27. This amount is clearly insufficient. There will, of course, be claims by both the companies and the unions involved in multiemployer plans that increased premiums are unjustified and unaffordable. These claims should be treated with skepticism. The most specious argument is that “PBGC won’t run out of money for years.” (This is the sort of claim that, if a private insurance company ever made it, would result in losing all its customers and its management losing their jobs.) It would be cold comfort to the millions of people who expect PBGC to pay benefits for the rest of their lives that they won’t lose their benefits until it’s too late for them to do anything else. Nonetheless, there are some plans for which significant increases would impose real hardship. That’s why increases should take into account an individual plan’s ability to pay, whether by delegating some ability to PBGC to reduce premiums or developing other kinds of “circuit breakers”. The Administration has recognized the need to increase PBGC premiums very substantially, and has proposed giving PBGC authority to increase multiemployer premiums by an average of $1.5 billion per year. In the end, it will of course be Congress that decides, but I hope the proposals will inform and encourage Congressional action this year. Congressional delay will limit PBGC’s ability to preserve multiemployer plans and the millions that depend on those plans. In order to encourage employers to remain within the multiemployer system, both unions and employers have proposed to allow new plan designs. Under these proposals, existing plans could be split into a new ongoing plan and a legacy plan. The new plans would be designed so that, if actuarial assumptions prove optimistic or investment returns are poor, the benefits can be adjusted. This ability to adjust benefits without having to go through a MPRA process means that the new design puts market risk on employees rather than employers. The primary reason for enabling a new plan design is that employers would be willing to participate in the new plan instead of leaving the multiemployer DB system entirely. The new plan design includes lifetime income, pooled professional management, and other features that make it superior to standard defined contribution offerings. It would eliminate the contingent risk and withdrawal liability that employers dislike. If the multiemployer pension system is to survive, it must be allowed to adapt. Unfortunately, ERISA and the tax code have been written so narrowly that adaptation has been hamstrung. 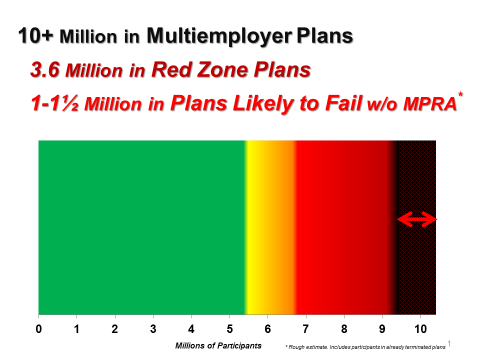 The alternative plan designs would help preserve the multiemployer system. Legacy Plans Need Much Greater Protection One of the hardest questions, if employers start a new plan, is how to protect the integrity of the old plan. Unfortunately, the current proposal seems to weaken protections of legacy plans from current law in several respects. For example, underfunded legacy plans could remain underfunded for 30 years while contributions are transferred to the new plan. Furthermore, the proposal would allow employers to withdraw and eliminate any legacy liabilities once a plan is considered fully funded under any “reasonable” actuarial assumptions (however unrealistic they turn out to be in practice). The result, very possiblly, would then be mass withdrawal from the legacy plan. Since most multiemployer plans are already significantly underfunded, the effect of the proposal would be both to weaken funding requirements and to eliminate the active employer base. If, over time, the “reasonable actuarial assumptions” of a legacy plan were not met – an occurrence that has roughly a 50% chance of happening – there would be no option of additional employer contributions. Having been abandoned by employers, the only alternative would be benefit cuts, whether through benefit “suspension” or assumption of the plan by PBGC. If there is going to be an elimination of withdrawal liability, then the requirement should be that a plan is overfunded, not just “fully funded”. Furthermore, the actuarial assumptions used should themselves be conservative, not just whatever a hired actuary thinks are “reasonable”. Other protections are probably appropriate as well. 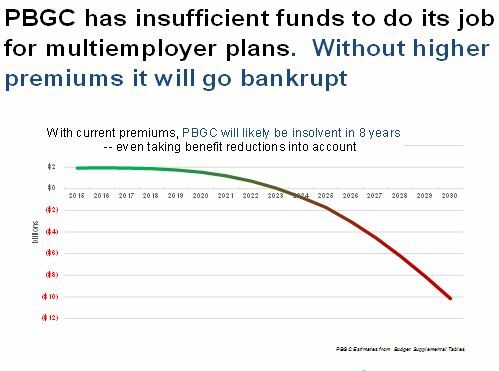 Adequate PBGC Funding As noted earlier, at current premium levels PBGC’s multiemployer program will itself become insolvent within a decade. Unless Congress decides otherwise, the new plans would not involve PBGC premiums and thus would narrow the base from which PBGC can fund its activities. Congress should consider providing some (probably different) PBGC premium for the new plan designs. In closing, I remain grateful that the Committee continues its work to take up the undeniable challenges that some plans now face and to consider how best to achieve the secure retirement that Americans deserve. If I can be helpful, I would be honored to do so. Given the level of controversy, it is not a surprise that MPRA was negotiated, enacted, and signed into law as part of the omnibus appropriations bill in a post-election session. However, the claim by opponents of MPRA that there had been no hearings or other legislative process is inaccurate. I personally testified at several hearings and attended multiple public meetings on these issues. The claim that, prior to MPRA, ERISA had never allowed benefit cuts under any circumstances is inaccurate. Cuts have been allowed under some circumstances ever since the initial multiemployer pension legislation in 1980. E.g., S. 1631, the “Keep Our Pension Promises Act” sponsored by Senators Sanders, Brown, and Baldwin. There is an additional group whose cuts will be repaid by their former employer, UPS, so the total percentage that will not suffer pension cuts is considerably higher. By law, PBGC should have produced this report in 2015. Its status has not been reported publicly. 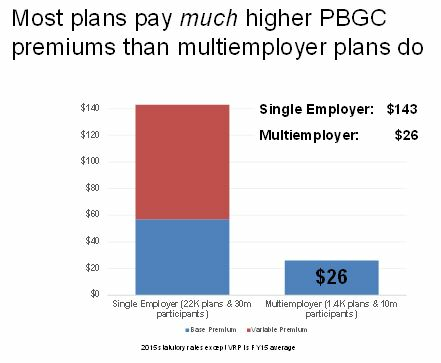 To be sure, under law PBGC’s multiemployer benefits are much less generous than its single-employer benefits. However, the primary argument against PBGC benefits is not the lack of coverage, but the claim that they’re unaffordable. Furthermore, even at the lower level of multiemployer guarantees, it is still the case that more than 1,000,000 people could end up relying on them. If PBGC becomes insolvent and active employers continue to withdraw, then that 1,000,000 people could end up with no pensions at all.